This is a tale about Osceola, a one-winged eagle that returns to the sky through hang gliding. His story begins in 1983 in a field in eastern Arkansas. Two rabbit hunters were crossing this field when they spotted an immature Bald eagle on the ground, trying to become airborne. They noticed his left wing dangled as he ran and concluded that he had been injured. The two quickly surrounded the bird and one of the hunters took his jacket off and tossed it over the eagle. This confused him and allowed the hunter to scoop him up in a protective wrap and gave the man control over the raptors powerful feet. The hunters promptly called the local game warden and transferred the eagle to him. At the time, I worked at the Memphis Zoo and ran the Raptor Rehab Program. The warden called me, and told of the injured bird and asked if I could meet him near Osceola, Arkansas. 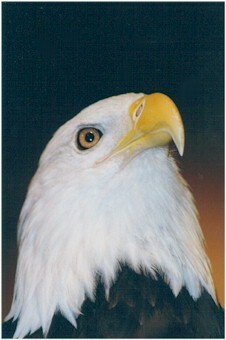 He said that the eagle appeared to have a compound fracture and advised me to bring something to wrap the birds wing. I drove for an hour, met the warden and sure enough, the bone was exposed and the wing looked pretty bad. I carefully wrapped the wing and returned to the zoo. The staff vet, Dr. Mike Douglas did a more thorough exam where he x-rayed the birds entire body and checked for parasites. Dr. Douglas decided to pin and wire the broken humerus back together but had doubts that this would help. The eagle had apparently been on the ground about a week before he was found. Despite three days of work and heavy antibiotic treatment, the wing refused to heal. The eagle, now named Osceola, had become very sick due to all of the toxins in the severely infected limb. A decision was made to amputate the wing in order to save the birds life. He would never fly again, but at least he would be alive. Osceola quickly rebounded from the surgery and adjusted to the lack of a left wing. I soon began taking him on the education shows I did. Over a year went by and Osceola had become well known in the Memphis and Mid-south area. Even though he wasnt white-headed yet, people were excited to see our National Symbol up close. Most were saddened by what had happened to him and many expressed dismay that he would never fly again. An idea came to me. Perhaps he could fly again with my help. 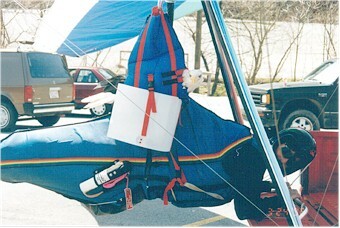 I had been a hang glider pilot for about nine years. Maybe I could construct a harness for him and take him flying with me. Pilots took their dogs with them, why not an eagle? The idea was good, but my work situation did not lend itself to flying with Osceola. To my disbelief, he was ordered to be sent to another zoo or wildlife facility. I had been in contact with a group in Nashville that was starting a raptor rehab and educational facility. The outlook for my future employment with this organization looked pretty good. The proper arrangements were made and Osceola was sent to the Cumberland Wildlife Foundation. He was there for about a year when I joined him in early 1986. Reunited, we did more educational shows than ever before, including the "Save The Eagle" campaign. Osceolas fame began to spread. He began hob-nobbing with some of the country stars, the Governor of Tennessee and was made an Honorary Citizen of Nashville. He was even becoming known to the hang gliding community as we did shows for the Tennessee Treetoppers, the 88 Nationals and the East Coast Championships. Flying with Osceola had not been forgotten, but shelved at this time due to what was to become a reoccurring theme in my life, a busy work schedule. In 1989, I decided that maybe it was time to try to get Osceola in the air. I contacted Mark Stump, a pilot in Arkansas, who made harnesses. I discussed with him my plan and then sent him Osceolas dimensions and materials for a harness. 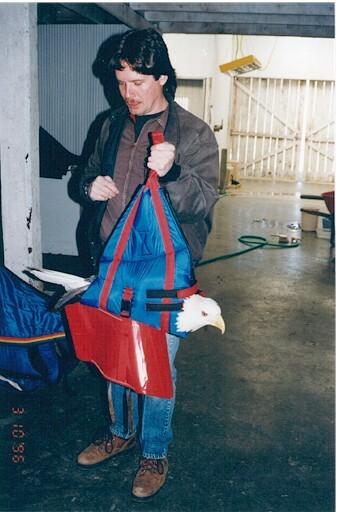 Mark quickly made the first of three harnesses for the eagle. This one was simply too small. It wasnt Marks fault, I simply forgot to leave room for sewing in the zippers. He made a larger second harness which appeared to be the right size. I had become very busy that year. The Cumberland Wildlife Foundation was in a state of economic collapse. We were a non-profit organization with about sixty birds to care for with little money in the bank. The Presidents solution was to find another job, so I was left to try to keep the organization alive and the birds fed. The time and money to go hang gliding was severely limited. Salvation came later that year when the non-profit group, The National Foundation to Protect Americas Eagles, (now known as American Eagle Foundation) headed by Al Cecere, took over the CWF's birds and hired me on. The CWF folded soon thereafter. Flying with Osceola was once again backburnered due to a busy work schedule. My own flying was limited to a few mountain flights and training hill work. Osceolas harness did get used in rehabilitating a couple of injured eagles. At least it was getting some hang time and we learned that we needed to make some improvements as a result. Finally, in December of 1995, I told Al, my boss, that I would like to make a serious effort to fly with Osceola. He was behind me, but insisted that we do a lot of planning before an actual flight was made. One of the eagles we were rehabilitating managed to wiggle out of the harness with a little effort. Al Cecere had made the observation during late night visit to our rehab facility, and informed me about it. This was something I didnt want to happen to Osceola at 3000 feet! Modifications were in order. An internal zipper and some Velcro straps would be needed to comfortably restrain him. The harness was not in the best of shape either, so I took it to Lookout Mountain Flight Park to see what they could do with it. I talked to Alan, Kat, and Meredith of the harness shop and with all the changes needed, Alan said that it would be cheaper to build a new one. Thus a new, improved harness was constructed, shipped, and then given its first fitting. To my surprise, Osceola did very well in it. Even hanging for periods of 15-30 minutes, he was very calm. A few minor modifications were made, but this new harness would be the one to take him back to the sky. The next step was to climb into my harness and hook the harnessed Osceola in next to me. He was hanging a little to close to me, so an outrigger system was devised to move the eagle about 6 inches out, but would still be connected to my hang point. This worked fine. The next problem was to somehow isolate his 2.5 inch talon from my harness and me. I did not want his talons scraping my harness or have him grab something and become entangled. I devised a foot shield to keep this from happening. We were now in the ground testing phase. My friend Tim Locke, also a pilot, donated the use of his truck. 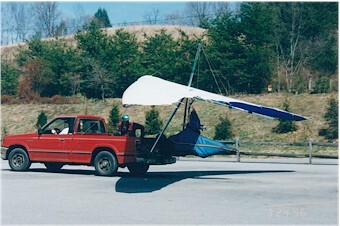 We placed my assembled glider, in flying position, in the bed of his truck (a la platform towing). I then hooked in and Osceola was then hooked in to my harness. We then proceeded to drive around one of Dollywoods huge parking lots. This gave Osceola the sensation of movement and he was fine until we began a turn. At this point, he would start to move his feet and would snag one of his talons on the foot shield causing him to panic. I finally decided to remove the shield and attached Osceolas leather jesse straps to a bungee. The bungee was then connected to the end of my harness. This worked! On our next circuit, Osce calmly enjoyed everything, including the turns. I then modified the foot shield where it would only be on the side of my harness and on the side facing the flying wires. One of the biggest obstacles to overcome was to get permission from the U.S. Fish and Wildlife Service. Al, my Boss, reminded me that I would have to get permission from the Service before I could fly with Osce. I drafted a letter that Al made additions to and sent a copy to our regional Fish and Wildlife Service office in Atlanta. We worked closely with Carmen Simonton of the Permit Office and she carefully guided us through the intricate twists and turns. Originally, permission was denied, but with Carmens help, the O.K. was finally given, especially since the flying was going to be included in an educational special about eagles and the NFPAE on the Disney Channel. We were now ready for real flight. The method I chose to get us airborne was aerotowing. Since the glider pilot in aerotowing is already in flying position, this would prove to be the ideal way to get Osceola in the air. I chose to do the aerotowing at Lookout Mt. Flight Park. It was close by and LMFPs aerotow team has over five years of towing experience. I made my first aerotows two years ago here and was comfortable with the setup. Matt Taber generously loaned me the use of a Falcon 195. For the Osceola flights, the Falcon would be easier to tow than the Formula I fly and this ease of towing would allow me to concentrate on the eagle during the flights. 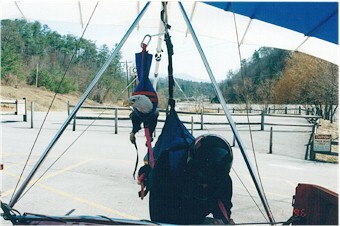 On the first trip to Lookout, I made the first tow flight with Osceolas harness. I wanted to see if the modified foot shield would cause any problems. Sure enough, the shield caught too much air causing the harness to turn sideways. I landed and looked for a solution. Al Cecere suggested that I take the shield off and wrap Osceolas feet and talons with a bandage like we do when we band wild eaglets. This would allow free movement of his feet without his talons scraping my harness. I would have flown with Osceola that day, but we didnt have anything with which to wrap his feet. We returned a week later, this time Al and I wrapped Osces feet with foam rubber and a stretchy self-sticking bandage called Vet Wrap. With Osceola loaded and wrapped, I climbed into my harness, hooked into the glider and Osceola was then attached to my harness by Al. We were now ready. I signaled to the tow pilot, Neal Harris, that we were ready to go. The ultralight engine was revved and we were soon rolling to a takeoff. The glider lifted off the dolly and I held my altitude at about twenty feet until the tug got into the air. I could feel Osceola moving his feet and Im sure he didnt expect to be this high above the ground. As we started to gain altitude and the ground dropped away, he settled down. He began looking around, perhaps realizing that he was in the air again. After thirteen years, he was back in his element, albeit not exactly as he had known before, but as close as "humanly" possible. We quickly reached 2000 feet and I pulled the release lever. We were now free flying around 20 m.p.h. Osce was turning his head looking at the top of the mountain, the sky, the ground, the glider, and me. About 100 feet below us was a pair of Red-tailed hawks. He immediately spotted them and watched as they passed to the front, side and finally behind us. Perhaps, it was at this point that Osceola realized that he was in the sky again. For thirteen years, he could only look up at soaring hawks. Now, he was looking at the tops of their wings! Osceola really seemed to enjoy the flight. He had to get used to my turns and would move his feet when I made one. After about ten minutes of free flying, it was time to land. I landed on my wheels, elated that the flight went so well. As I unhooked from the glider, Osceola had a look like, "Hey rookie, is that the best you can do?!? Gosh, I used to land in trees better than that!" I decided that one flight was enough for the day and drove back to Pigeon Forge. On the drive home, I reviewed the flight. Something struck me...I have always felt bad for Osceola, for what had happened to him. But thinking about the way he watched the Redtails below us, made me sad and a little choked up. How he must miss flying! He no longer enjoys the freedom to go where he wants. Even I have more freedom as a flying bird-man than he does. We returned a week later, this time with a film crew from the Disney Channel. At sunset, we made a beautiful 2000 ft.tow. Matt Taber piloted the Dragonfly, with a cameraman to document the flight. The cameraman said that there wasnt enough light left for filming. It didnt matter to Osceola, he was flying again. He got to see the sun setting behind Lookout and a world painted with orange and rosy hues. After we landed, Al unhooked Osce from the glider and I put him in his sky kennel for the night. The film crew attached a digital video camera to the gliders left wing in preparation for the next mornings early flights. Thursday dawned clear and cool. We got everything ready to take advantage of the calm morning air. The glider was set on the launch dolly and wheeled into place. Neal took the tug for a flight to check the morning air. He landed and announced "Smooth as glass!" Osceola was harnessed and his feet wrapped by Al and I, then I suited up and hooked myself to the glider. Then Al hooked Osceola to the glider and latched him to my pod. Al checked and double checked to make sure everything was safe and secure. Then he laid his hand on the helmet on my head and said a prayer. This time, our flight plan was to go to 4000 feet. This would allow Matt and the cameraman in the chase ultralight to get plenty of shooting time. The tug was in position, the tow line was then connected to the glider and me. A check was made of the release system. We were now ready. This would be the highest flight Osceola would have made in thirteen years. The takeoff was uneventful and we began our 10 minute climb to the designated altitude. The air was incredibly clear! I was amazed at how far I could see and how crisp and detailed everything appeared. By the time we reached release altitude, I could see the Tennessee River as it wound its way around Chattanooga and churned towards the northwest into Alabama. I could see the Smoky Mountains, some 70 miles in the distance and could recognize some of the familiar peaks. No telling what Osceola could see with his superior vision. Could he have possibly seen Atlanta some 100 miles to the south? I was soaking in the view probably as much as Osceola was. His head was in motion, looking one way and then the other. His eyes reflected a sense of fascination. The glide down didnt last as long as it normally would have. When the photo ultralight would come close by, I would increase my speed to match its speed, degrading my glide in the process. This time, Osceola didnt seem to mind the speed, maybe because we were higher. We made three more flights that day. With each flight, Osceola became calmer during the launch and landing procedures. We took our last flight, and since thermals starting to form, it was a little bumpier than the first three. We entered a small thermal and gained a small amount of altitude, once again something Osceola hadnt experienced in a while. Since the camera was moved to the front of the glider, our last landing was made on the wheels. It too, went well. Al unhooked Osceola from the glider and my pod, and I put him, minus his harness, on his traveling perch. This allowed him to cool off and get a well-deserved drink of water. He had a different look about him. Not one of fear, but possibly one of elation. He had now made eight flights and had a total of 2 hour and 10 minutes of airtime. Not bad for an eagle with one wing! As I look back on our flights, it is almost hard for me to believe that this has finally happened. It has been a 12 year dream, one filled with false starts and occasional disappointment, but a dream I never gave up. I have finally been able to give something back to Osceola, something we both understand. I would like to thank Matt Taber and the folks at Lookout Mountain Flight Park for helping me make this happen. Thanks also go to Al Cecere, my supervisor, and to Carmen Simonton of the U.S. Fish and Wildlife Service for her efforts to get the official permission to make this possible. Thank yous go to everyone else that helped make this a reality, including the members of the NFPAE staff who have been dedicated to caring for Osceola since 1991. As Osceola was sitting on his perch, a glider came in to land. He watched the glider and then looked at me as if saying "What are we waiting for? Lets go back for another!"